The actions and inactions a central bank takes to control a country's money supply. Generally speaking, monetary policy refers to the setting of interest rates. If the central bank sets low interest rates, it increases the supply of money by easing the availability of credit. This promotes economic growth but in the long term can cause inflation. On the other hand, the central bank may adopt a restrictive monetary policy by setting high interest rates, which constricts credit and slows or eliminates growth while reducing inflation. Monetary policy may also refer to the printing of money, especially to repay government debts; this always causes inflation and is used as a last resort. See also: Hyperinflation. The Federal Reserve actions that are designed to influence the availability and cost of money. Specific policy includes changing the discount rate, altering bank reserve requirements, and open-market operations. In general, a policy to restrict monetary growth results in tightened credit conditions and, at least temporarily, higher rates of interest. This situation can be expected to have a negative impact on the security markets in the short run, although the long-run effects may be positive because of reduced inflationary pressures. Compare accommodative monetary policy. A country's central bank is responsible for its monetary policy. In the United States, for example, the Federal Reserve aims to keep the economy growing but not allow it to become overheated. In a sluggish economy, the Fed may lower the short-term interest rate to loosen credit and allow more cash to circulate in an attempt to stimulate expansion. Or, if it fears the economy is growing too quickly, it may tighten credit by raising the short-term interest rate to reduce the money supply, in an attempt to rein in potential inflation. In pursuit of its monetary policy, the Fed can also increase or decrease the money supply by buying or selling government securities. To avoid a potential recession, for example, the Fed might increase its purchases of US Treasury notes and bonds from banks and brokerage firms, providing them with more money to lend. The regulation of the MONEY SUPPLY, CREDIT and INTEREST RATES in order to control the level of spending in the economy (see ECONOMIC POLICY). The monetary authorities (principally the BANK OF ENGLAND in the UK) can employ a number of measures to regulate the money supply, in particular that part of it which is used to underpin the provision of credit, including open market operations in government BONDS and TREASURY BILLS, special deposits and directives. Open market operations are targeted at the liquidity base of the banking system and involve the sale or purchase of bonds and Treasury bills which alters the amount of bank deposits held by the COMMERCIAL BANKS and thus their capacity to advance LOANS and OVERDRAFTS to customers. For example, if the authorities wish to reduce the money supply they can sell long-dated bonds to the general public. Buyers pay for these bonds by running down their bank deposits – an important constituent of the money supply – which forces the banks in turn to reduce the volume of their lending. A special deposit call by the authorities requires the banks to place a specified proportion of their liquid assets on deposit with the Bank of England which are then ‘frozen’, i.e. they cannot be used by the banks as the basis for advancing loans and overdrafts to customers, again reducing the money supply. A directive is a request by the Bank of England to the banks to keep their total lending below a specified global ceiling or to reduce their lending for particular purposes (for example car purchase). The authorities can also operate INSTALMENT CREDIT controls on lending by FINANCE HOUSES to limit spending. They can, for example, discourage potential borrowers from using instalment facilities by increasing the down payment required and by reducing the time period of the loan; the former stipulation requires the borrower to find more ready cash, while the latter increases the effective interest charge payable. The authorities may seek to influence interest rates more widely rather than just on particular categories of borrowing. In May 1997, responsibility or setting interest rates was handed over by the government to the Bank of England's MONETARY POLICY COMMITTEE, thereby making the determination of monetary policy ‘independent’ of political control. In practice, the application of monetary policy is fraught with difficulties. The main problem is that there is no single reliable definition of the money supply (see MONEY SUPPLY for details), so that any attempt to target a particular specification of the money supply tends to be undermined by asset-switching from other categories. To illustrate briefly: if the authorities target M3 (mainly currency plus bank deposits) for control purposes and use the various instruments noted above to reduce the level of bank deposits, this may not be sufficient in itself to reduce spending. Spenders may simply switch to ‘M4’ type money, running down their building society deposits to finance current purchases. The central bank's ability to effectively control the money supply and interest rates has been increasingly questioned as a result of FINANCIAL INNOVATION outside the traditional banking system. For example, the proliferation of credit cards by non-bank operators such as retail stores has led to an increase in the availability of ‘instant’ credit without the traditional negotiation of a loan or overdraft with a bank manager; and even ‘official’ interest rates are being circumvented by durable goods retailers who have been increasingly prepared to offer customers “0%” interest deals on purchase of cars, furniture, televisions etc. For most of the period since 1945, monetary policy has been used as a short-term stabilization technique but has largely taken second place to FISCAL POLICY. In the past authorities have occasionally set ‘targets’ for monetary policy; for example, in the 1980s the ‘Medium Term Financial Strategy’ set rolling annual targets for the money supply aimed at reducing the growth of the M3 money supply and INFLATION rate. In 1997 the incoming government singled out the control of inflation as its number one economic priority and set an inflation ‘target'of an increase in the RETAIL PRICE INDEX (RPIX) of no more than 21/2% per annum (now CPI – ?%). In an unprecedented move, as noted above, the government transferred the power to set ‘official’ interest rates from itself to the Monetary Policy Committee of the Bank of England. In doing this the government took the view that a low inflation economy was essential in order to achieve another of its priorities – low UNEMPLOYMENT. In the European Union, the EUROPEAN CENTRAL BANK (ECB) is responsible for monetary policy in general and for setting interest rates in particular for member countries of the ECONOMIC AND MONETARY UNION (EMU). The ECB has committed itself to a ‘target'for INFLATION of no more than 2% per annum. See MONETARISM, BUSINESS CYCLE. An instrument of DEMAND MANAGEMENT that seeks to influence the level and composition of spending in the economy and thus the level and composition of output (GROSS DOMESTIC PRODUCT). The main measures of monetary policy are control of the MONEY SUPPLY, CREDIT and INTEREST RATES. Open market operations are targeted at the liquidity base of the banking system and involve the sale or purchase of bonds and Treasury bills that alters the amount of bank deposits held by the COMMERCIAL BANKS and thus their capacity to advance LOANS and OVERDRAFTS to customers. For example, if authorities wish to reduce the money supply, they can sell long-dated bonds to the general public. Buyers pay for these bonds by running down their bank deposits - an important constituent of the money supply - which forces the banks in turn to reduce the volume of their lending (see BANK DEPOSIT CREATION). A special deposit call by the authorities requires the banks to place a specified portion of their liquid assets on deposit with the Bank of England. These assets are then ‘frozen’, i.e. they cannot be used by the banks as the basis for advancing loans and overdrafts to customers, again reducing the money supply. A directive is a request by the Bank of England to the banks to keep their total lending below a specified global ceiling or to reduce their lending for particular purposes (for example, car purchase). The authorities may seek to influence interest rates generally rather than just on particular categories of borrowing. 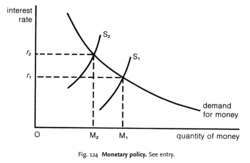 By reducing the supply of money relative to the demand for it, the authorities can increase the price of money, i.e. the interest rate, with a view to deterring borrowing in general. For example, if the central bank wishes to raise the interest rate, say, from Or1 to Or2 in Fig. 124, then they can do so by reducing the money supply from OM1 to OM2. With the given demand curve for money, this would have the effect of raising interest rates as required. Moreover, the authorities can intervene directly to impose an ‘official’ interest rate that in turn determines all other short-term interest rates (see BASE RATE, BILL-DISCOUNTING INTEREST RATE, INTERBANK CLEARING INTEREST RATE). In 1997 the government transferred responsibility for setting the ‘official’ interest rate from itself to the Bank of England's MONETARY POLICY COMMITTEE. In practice, the application of monetary policy is fraught with difficulties. One problem is that there is no single reliable definition of the money supply (see MONEY SUPPLY for details), so any attempt to target a particular specification of the money supply tends to be undermined by asset-switching from other categories. To illustrate briefly: if the authorities target M3 (mainly currency plus bank deposits) for control purposes and use the various instruments noted above to reduce the level of bank deposits, this may not be sufficient in itself to reduce spending. Spenders may simply switch to ‘M4‘ type money, running down their building society deposits to finance current purchases. The central bank's ability to effectively control the money supply and interest rates has been increasingly questioned as a result of FINANCIAL INNOVATION outside the traditional banking system. For example, the proliferation of credit cards by non-bank operators such as retail stores has led to an increase in the availability of‘instant’ credit without the traditional negotiation of a loan or overdraft with a bank manager; and even ‘official’ interest rates are being circumvented by durable goods’ retailers who have been increasingly prepared to offer customers ‘0%‘ interest deals on purchases of cars, furniture, televisions, etc. In addition, the ‘openness’ of national economies to inflows and outflows of foreign currencies makes it difficult for a government to operate domestic monetary policy without having to consider the international implications of their policy. For example, a country pursuing a policy of domestic credit contraction, leading to higher interest rates, would tend to attract inflows of foreign currencies which serve to increase the EXCHANGE RATE value of its currency. For most of the period since 1945, monetary policy has been used as a short-term stabilization technique but has largely taken second place to FISCAL POLICY. In the past, the authorities have occasionally set ‘targets’ for monetary policy; for example, in the 1980s the MEDIUM-TERM FINANCIAL STRATEGY set rolling annual targets for the money supply aimed at reducing the growth of the M3 money supply and the INFLATION rate. In 1997 the incoming government singled out the control of inflation as its number one economic priority and set an inflation ‘target’ of an increase in the RETAIL PRICE INDEX (RPIX) of no more than 21/2% per annum. In an unprecedented move, the government transferred the power to set ‘official’ interest rates from itself to the MONETARY POLICY COMMITTEE (MPC) of the Bank of England. In doing this, the government took the view that a low-inflation economy was essential in order to achieve another of its priorities - low UNEMPLOYMENT (see EXPECTATIONS-ADJUSTED/AUGMENTED PHILLIPS CURVE). Moreover, fiscal ‘prudence’, specifically a current budget deficit (PUBLIC SECTOR BORROWING REQUIREMENT) within the European Union's MAASTRICHT TREATY limits of no more than 3% of GDP, was adopted as a necessary adjunct to avoid excessive monetary creation of the kind that has fuelled previous runaway inflations. In December 2003 the RPIX was replaced by the CONSUMER PRICE INDEX (CPI) as the government's ‘official’ measure of inflation and the inflation ‘target’ was reduced to 2%, thus bringing it into line with European Union practice. In the European Union, the EUROPEAN CENTRAL BANK (ECB) is responsible for monetary policy in general and for setting interest rates in particular for member countries of the ECONOMIC AND MONETARY UNION (EMU). The ECB has committed itself to a ‘target’ for inflation of no more than 2% per annum. See ECONOMIC POLICY, MONEY-DEMAND SCHEDULE, MONEY SUPPLY/SPENDING LINKAGES, TRANSMISSION MECHANISM, MONETARISM, QUANTITY THEORY OF MONEY, FINANCIAL INNOVATION, MONETARY ACCOMMODATION, FUNDING, INTERNAL-EXTERNAL BALANCE MODEL, I-S/L-M MODEL.